Sure, the Radeon R9 390X still uses the same GPU as the older R9 290X, but this supercharged version admirably takes the fight to the GTX 980. The new Radeon R9 390 and R9 390X graphics cards aren’t mere re-brands! That’s the message AMD’s PR has been shouting at every possible opportunity ever since the “new” Radeon R300 graphics cards were released in June. 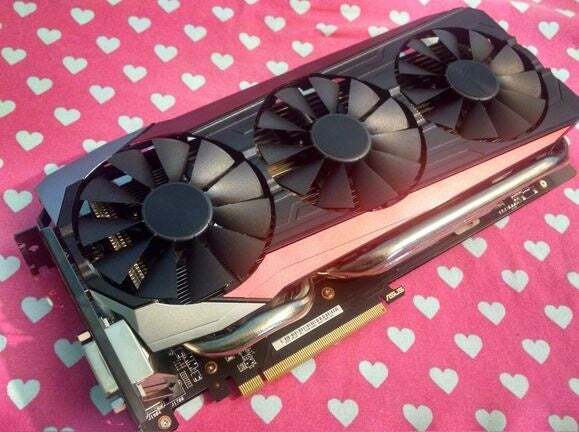 There’s good reason for that: While AMD’s new Fury X and Fury graphics cards rock a beefy new Fiji graphics processor with high-bandwidth memory, the R300 lineup packs the same graphics processors that beat in the hearts of the older R200 series graphics cards. The fact that reviewers weren’t given samples to test before the R300 cards hit the streets only added fuel to the flames of suspicion. But AMD’s PR was kinda-sorta right. These cards weren’t simply slapped with a new name and pushed back onto store shelves in a fresh package. While the older R9 290X was closer in performance to the $330 Nvidia GeForce GTX 970, the R9 390X outpunches the mighty $500 GTX 980 at stock speeds—and for significantly less cost than Nvidia’s offering. On the other hand... well, let’s just say it’s complicated. At its core, the $429 Radeon R9 390X packs the same basic 28nm “Hawaii” GPU as the 290X, though the retuned version has been christened “Grenada.” Core GPU specs remain the exact same: You’ll still find 2,816 stream processors, 176 texture units, 64 ROPs, and a 512-bit memory bus inside the R9 390X, just like with its predecessor. There’s little truly new here, especially since the recent Catalyst 15.7 drivers brought previously R300 series-exclusive software features to the older R200 series cards. That said, AMD engineers spent over a year optimizing the GPU to coax more performance out of it, enabling the company to push core clock speeds an additional 50MHz to 1,050MHz, and boost memory clock speeds from 1,250MHz to 1,500MHz, causing overall memory bandwidth to jump from 320GBps to 384GBps. (The GTX 980 offers 224GBps.) There’s flat-out more memory too, with all versions of the R9 390 and 390X sporting a hefty 8GB of GDDR5 RAM. AMD says the GPU’s power management micro-architecture was completely rewritten as well, though it’s still a power-hungry animal, as well see later. The Asus Strix Radeon R9 390X’s specifications. 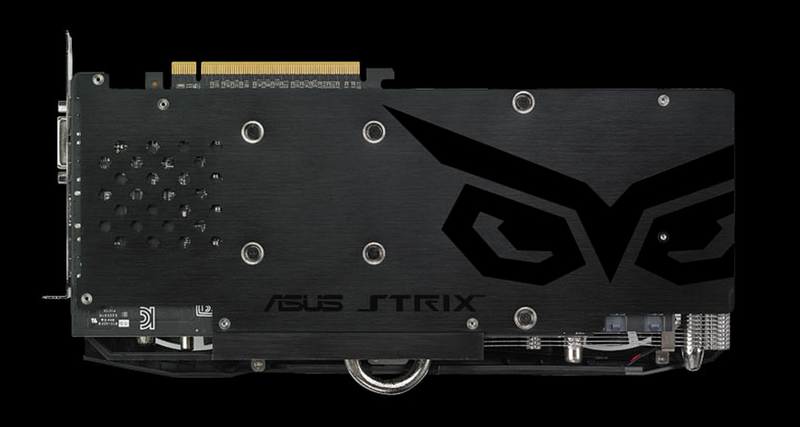 The $470 Asus Strix R9 390X we tested pushes things even further. Out of the box, the card is overclocked to 1,070MHz, and you can opt to easily push that to 1,090MHz with the click of a button in the included GPU Tweak II software. Aiding that overclock is Asus’ beefy, stellar DirectCU III custom cooler design—the same one found on Asus’ Radeon Strix Fury graphics card. It’s comprised of a large, full-length heatsink augmented with massive, snaking 10mm heat pipes, topped with a trio of “triple wing-blade 0dB fans.” Ignoring all the marketing words, the Asus Strix R9 390X proves to be remarkably quiet in practice, producing barely a whisper even when you’re slamming it with the heftiest of workloads. The fans won’t even turn on until the GPU hits roughly 65 degrees Celsius, which means you’ll get a truly silent gaming experience with more modest titles. DirectCU III truly delivers. 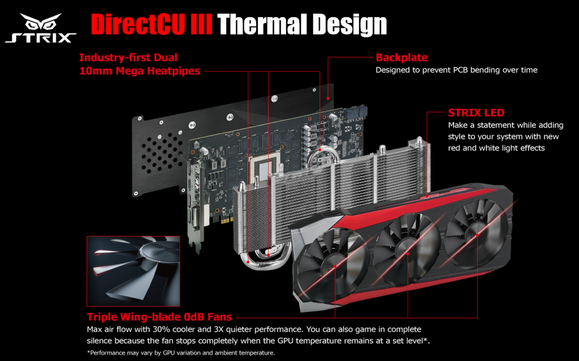 Details about the Strix R9 390X’s DirectCU III cooling system. 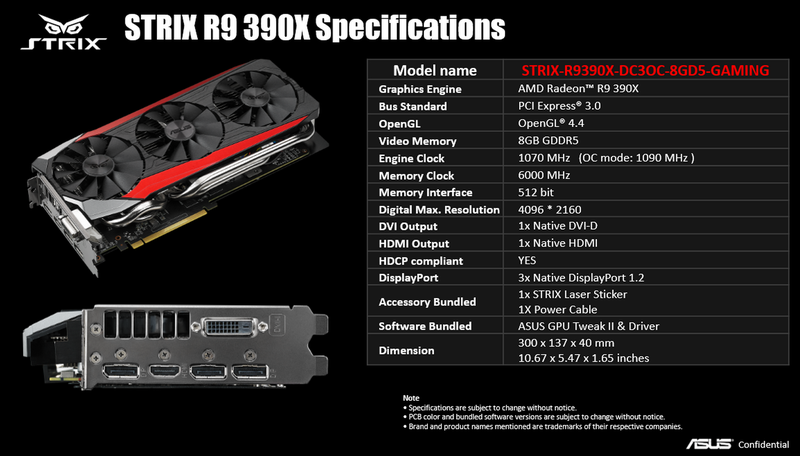 The Strix R9 390X delivers more thoughtful touches, as well. 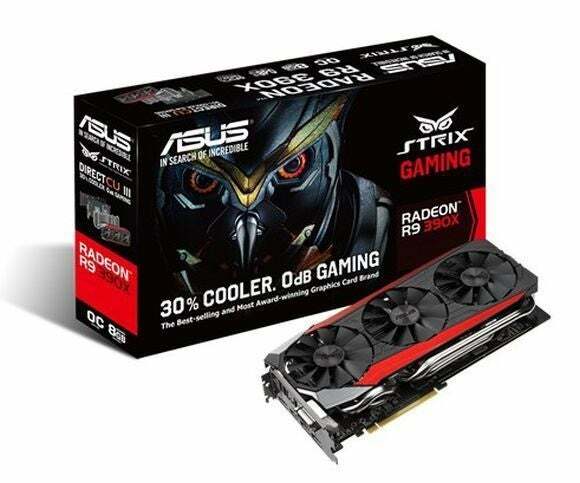 The card comes with a slick backplate adorned with the Strix owl logo. A nifty, pulsating red LED on the side is also festooned with a white Strix logo. (I’m a sucker for case lighting.) Asus manufactures the card with what it calls “8-phase super alloy II” materials, claiming it all to be aerospace-quality parts. The super alloy II capacitors boast two-and-a-half-times the lifetime of traditional capacitors, while Asus says its fortified components and DIGI + VRM power delivery solution delivers top-tier overclocking capabilities. This card screams “premium,” but be warned, tiny case owners: All those features turn the Strix R9 390X into a fairly bulky graphics card. The Strix R9 390X’s backplate. The Strix R9 390X sips 275W of power through one six-pin and one eight-pin connector, and it packs all the connections you could reasonably need, with DVI-I, HDMI, and a trio of DisplayPorts. The HDMI connection is only 1.4a, meaning it’s limited to 30Hz at 4K resolutions, but realistically speaking neither the 390X nor Nvidia’s competing GTX 980 deliver a compelling single-card 4K experience, no matter what each company’s marketing teams claim. These cards are better for 2560x1440 gaming. If you decide to try it anyway, or want to slap multiple R9 390X cards in your system in a CrossFire setup, the DisplayPorts support 4K at 60Hz. We tested each title using the in-game benchmark provided, and stuck to the default graphics settings unless mentioned otherwise. V-Sync, G-Sync, and FreeSync were always disabled. Continue to the next page for the Strix R9 390X’s performance results.